Fort Valley State University scholars will showcase outstanding scholarship during an annual event that spotlights student research. The campus will host its sixth annual Research Day on Thursday, April 14, 2016, from 8:30 a.m. to 4 p.m., in the C.W. Pettigrew Center. During the morning, students will present their research findings from a variety of academic disciplines from FVSU’s four colleges: Agriculture, Family Sciences and Technology; Arts and Sciences, Education; and Graduate Studies and Extended Education. Undergraduate and graduate students are invited to make poster, oral, and artistic submissions. Faculty members are encouraged to mentor students through the process so that they can be prepared to participate in the event. Student scholars will present research in three areas: oral, poster and artistic presentation. Students that win the top prizes during the research presentation will receive awards during an awards banquet that will start at 11 a.m. The deadline for all submissions is 5 p.m. Thursday, March 17. For questions or assistance, please contact Dr. Andrew Lee, FVSU’s Undergraduate Research Program director, leea@fvsu.edu or (478) 825-6708. 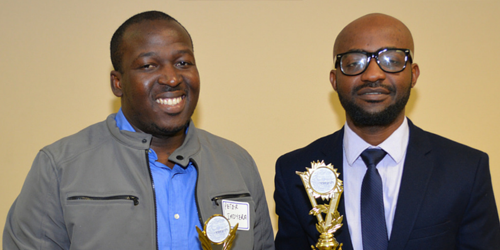 Caption: Students accept awards at the 2015 Research Day event.